Co-Regional Advisor, SCBWI-Michigan. Author of narrative nonfiction picture book STRETCH TO THE SUN: FROM A TINY SPROUT TO THE TALLEST TREE ON EARTH (Charlesbridge), and informational fiction picture books A WARM WINTER TAIL and A COOL SUMMER TAIL (Arbordale). Recipient of an SCBWI Work of Outstanding Promise (WOOP) grant in 2013. Grand Prize Winner, SCBWI-MI Picture Book Mentorship Competition 2007 with Newbery Award author Lynne Rae Perkins.Author of WHEN CUBA CAME TO MARQUETTE (Michigan History Magazine, Sept/Oct. 2010). BA early childhood education, University of Michigan. 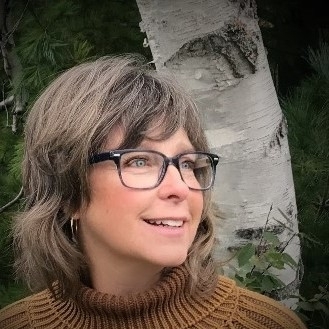 Founder and consultant, Children’s Book Connections. Former teacher then director of university-owned early childhood center, business development director for an international corporate finance company, associate director of development for University of Rochester Medical Center, and development officer for Marquette General Health Systems. I’m a wife, mom, daughter, friend, athlete, entrepreneur, community volunteer, and children’s book author. Woven between all of the roles I play in life is my love for writing. I’m passionate about words on paper and the impact they make on people–both large and small. My mission is to write memorable children’s books–the kind of books that resonate, make you look at the everyday in a new way, or give you a contagious belly laugh. That’s what I call memorable. My writing and reading interests are at the intersection of fiction and nonfiction — that sweet spot that makes you say, “Hmmm. I didn’t know that!” For current news, school visit information, and lots more, please visit my website.